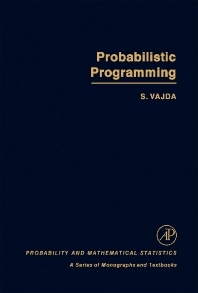 Probabilistic Programming discusses a high-level language known as probabilistic programming. This text specifically deliberates the decision regions for optimality, probability distributions, Kall's Theorem, and two-stage programming under uncertainty. The complete problem, active approach, quantile rules, randomized decisions, and nonzero order rules are also covered. This publication is suitable for developers aiming to define and automatically solve probability models. Steven Vajda, Visiting Professor at Sussex University, formerly Professor of Operational Research, Department of Engineering Production, University of Birmingham.